"GAINESVILLE, Fla.—Chris Rumph has been named the defensive line coach for the Florida football team, head coach Jim McElwain announced on Friday. Rumph replaces Terrell Williams, who accepted a coaching position with the Miami Dolphins. 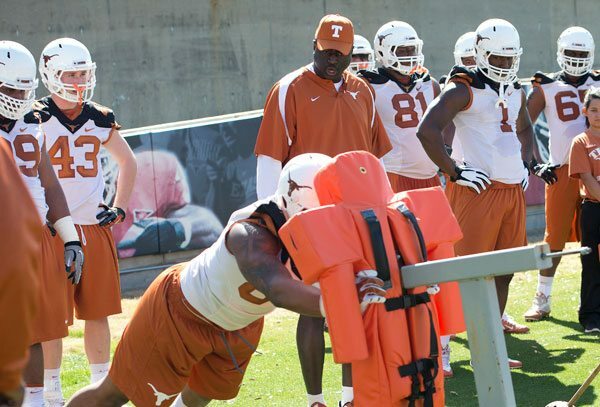 Rumph spent the 2014 season at the University of Texas as the Assistant Head Coach for Defense and Defensive Line Coach. He helped produced one of the best defensive line units in the nation, helping the Longhorns rack up 3.1 sacks per game (11th nationally). Defensive lineman Malcom Brown earned consensus First Team All-America honors and was a finalist for the Nagurski and Outland trophies under Rumph’s tutelage. Prior to his time in Austin, Rumph spent three seasons as the defensive line coach at Alabama under Nick Saban. The Crimson Tide ranked fifth nationally in total defense (286.5 yards per game) in 2013 and seventh in rush defense (106.2 yards per game). The previous year, Rumph was a part of Alabama’s National Championship team that featured a stout defense, leading the nation in rush defense (76.4 yards per game) and total defense (250.0 yards per game). The Tide also won the BCS title in 2011 with a top-ranked defense, allowing just 183.6 total yards per game, the fewest by an FBS team in records dating to 1996. Alabama also had the top-ranked rush defense, giving up 72.2 yards per game. In five seasons at Clemson (2006-10), Rumph and the Tigers defense ranked among the top 25 nationally in total and scoring defense each season. In 2010, Rumph coached unanimous All-America defensive end Da'Quan Bowers, who led the nation in sacks (15.5) and was tied for first in tackles-for-loss (26.0). He won both the Nagurski Trophy as the nation's top defensive player, and the Hendricks Award as the nation's top defensive end and was a second-round pick in the NFL Draft by Tampa Bay. In Rumph's first year with the Tigers, he worked with DE Gaines Adams, who was the fourth overall selection in the 2007 draft by Tampa Bay after receiving unanimous All-America honors as a senior. Adams tallied 12.5 sacks to rank fourth in the nation. Prior to his stint at Clemson, Rumph was the outside linebackers coach at Memphis for three years (2003-05). Rumph was the defensive backs coach at South Carolina State in 2002, following a five-year stint as head coach at Calhoun County High School in St. Matthews, S.C. He also served as offensive coordinator and quarterbacks/running backs coach at Calhoun County. Born in Orangeburg, S.C., Rumph also played in high school at Calhoun County. He signed with South Carolina and played linebacker from 1991-94, earning his bachelor's degree in 1994. He helped the Gamecocks record their first bowl victory in the 1995 Carquest Bowl. He and his wife, Kila, have two sons, Christopher and Elijah."